About a year ago I read a blog post (sorry cannot remember where) on the best social media tools. One of the tools mentioned was Fliptop. This is a tool that can take your email data, or your social follower data and append it with much more information on the individuals – e.g. if you have an email address then Fliptop can find all of the social profiles associated with that email address and append them to the email address. It can also run the same process starting with a Twitter handle. It seemed like a brilliant idea to me at the time as I was in a position where I had no email database but had over 1000 Twitter followers so was interested to see what the tool could do for me. I uploaded my Twitter followers into Fliptop and for free the system took 100 of my followers and appended their Facebook Profile URL, Linkedin Profile URL, and around 50 other social profiles. This data was then downloadable into a CSV. I ran it as a test to check the data and it was solid but then did not use again until last week. One of our clients is an established company in their industry and has a database of email addresses that they have built up over the years but they have now decided that they want to start using social media. I think that the key with social media is to build strong 1 to 1 relationships that then scale to more awareness through social sharing. Most of the relationships remain distant e.g. I have 1700 Twitter followers yet I have only probably conversed with 200 of them. If someone messages me or even mentions me then I respond directly as I believe this is an opportunity to strengthen the relationship – you never know where it may lead. The way I use Facebook is different – I rarely accept a friend request of someone I have not already met and most of my FB friends are good friends or old friends. So, going back to our client; they have around 10,000 contacts via email but around 30 Twitter followers and a similar number on Facebook. Therefore to get started in social media they should ideally connect with these people and build up followers and friends amongst those who are warmest to them – their existing customers and contacts. Fliptop has changed a little since I last used it – they are currently just advertising a subscription service for $99 per month OR if you are a Salesforce user then there is a free integration that will append all of the users data for free. 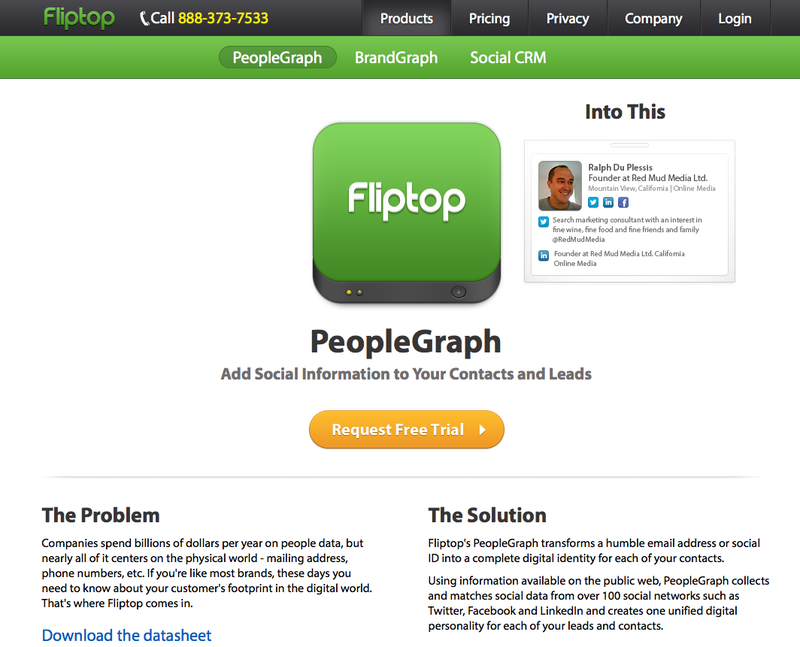 Here is a screenshot of the site showing the People Graph service overview – I suggest that you check it out on their site though. As our client does not have a database size that warrants a subscription service I contacted Fliptop to ask if they could be flexible and run a one off append to the email data. I received a response from a really helpful guy called Al Gerona within a few hours that told me that they would be happy to and that they were also launching a new web UI that allows you to run on pay as you go or subscribe via CSV in early 2013. A few days later I had a CSV from my client with all of the email addresses. Al recommended that for the highest match rate that you include First Name, Last Name, Email Address and Location. However – our client pulled the data from their email marketing system and did not want to spend the time cross referencing data so we just went with email address only. 2) All of the appended data in a CSV file including all social profiles that had matched each of the email addresses. I cannot include a screenshot of the actual data for obvious reasons but you can see here that 23% of the 10,000 contacts have a Twitter account attached to their email address and 5% are on Facebook. I am guessing that Facebook is lower as many people use personal email addresses for Facebook and business email addresses for Twitter, and many of this clients customers perhaps used their business email address when purchasing. An overall data match of around 40% is average according to Fliptop as of course not everyone has a social profile and also some people have multiple email addresses so the one you have in your database may not always match the one they use for one or more social media sites. What can we do with this social data? The first thing that is obvious is that the main opportunity for this client lies with Twitter. If we can get 10% of their current customers, who we know already use Twitter (2300 x 10%), to follow our client then we will have 230 new followers – roughly a 10 x improvement on the current situation. However – we are more ambitious than that and want to achieve around 50% follow back. To succeed with this the first thing that we did was to create an auto-follow list on TweetAdder. We simply uploaded the CSV of Twitter profiles that came back from Fliptop into TweetAdder and created a follow list of the 2300 approx profiles and set it to follow 50 each day. It will take one month and perhaps 10% of them will follow back. Yes, some people will frown on using a tool that Twitter do not publicly approve of. However, my argument on this is that we are using Twitter in line with how Twitter intend the tool to be used. We are connecting with people that are already familiar with our client so that we can strengthen the relationship with them. Tweet Adder is a tool that can enable spamming but it doesn’t have to be used as a spamming tool – it can be incredibly effective for building relationships ethically. The thought of individually finding 2300 people on Twitter and individually following them is simply a waste of time when it can be automated. There is one major flaw with this. When we have followed 2ooo of the contacts Twitter will stop us connecting with more unless we have a relatively even ratio of users following us. Simply relying on the probability that a percentage of the people we follow will then follow us back is not enough; we need to ensure that we get as a high percentage as possible following us back so that future scaling is not restricted. To do this we go back to the Fliptop appended data and pull out all of the email addresses that we have the Twitter accounts for. This allows us to email only the people that we know have a Twitter account associated with their email address. This has not been actioned yet but we are going to email all of these people to let them know that the client is now on Twitter and that we will be following them at some point within the next few weeks. We will also place a follow us button in the email that we will ask them to hit. People usually need an incentive to take action so we may need to sweeten things a little for them by offering a discount for them if they follow us back. But, wait a minute this is also the perfect opportunity to scale things. Rather than offering a discount for simply following us back we could ask them to follow us back AND tweet a tweet that we place in the email that contains a certain hashtag. This way we will pick up follows from our contacts as well as some of their contacts – anyone who tweets with the hashtag gets DM’d a unique discount code for the site. I will update the post with the results on how many followers we get through this exercise. So far we are getting about 10% of the people we follow following us back but I am hoping that this will be eclipsed very soon.